My vlogging life began five years ago on a sweltering SoCal day in April of 2013. Fresh out of breath from scaling a steep hill on my trusty eBay-bought Cannondale road bike, I pulled my iPhone 5 out of my pocket, flipped the camera and tapped the big red button. Now, five years later, the subject (me) remains the same and today, I have a plethora of new and improved means of recording myself, my life and the world around me. While the content and creativity remain as the important ingredients in the recipe for a compelling vlog, the gear is a key component. These are the things that help me share my life with the world. This collection of video production tools has proven itself time and time again. I’ve compiled what I think is a super-functional kit for the dedicated vlogger. And while it’s taken me years to land on this combination of items, and it will definitely continue to evolve, it can be used as a solid template for those looking to beef up their one man/woman band production pack. I’ll start with the key players for those for you who want the tl;dr version, and then I’ll work my way to the extra parts that really round it all out. Sony α7S II: This camera has long been my favorite way to capture video for just about three years now. My α7S II started out on my channel with a bang...literally. For my first vlog with camera, I took it to the roof of a Target in the San Fernando Valley north of Los Angeles to take some traffic timelapses and random b-roll, As I learned to operate my new toy, all of a sudden an unannounced Trident II missile lit up the sky while I was in the middle of recording. I pointed the camera to the sky completely in awe knowing that I was capturing something I was positive nobody else had seen yet. My video was promptly retweeted by Khloe Kardashian and got me on the local news. And while I can’t guarantee you’ll capture a missile on your first day with this camera, I do strongly recommend it. 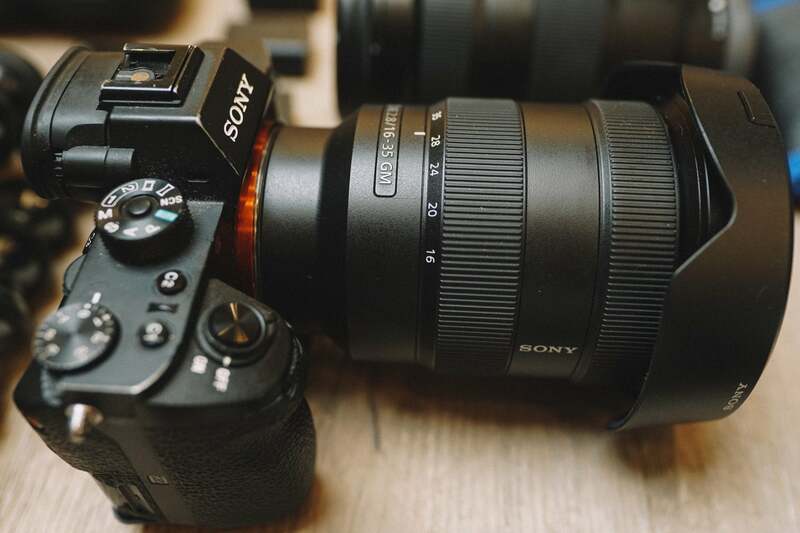 Sony 16-35mm f/2.8 G Master lens: I believe a wide lens is ‘The Vlogger’s Lens’. Being a one-man band requires maximizing each shot I’m able to grab. If I had to choose one lens to shoot with for the rest of my life, it would be this one. This G Master is incredibly sharp, even all the way to the edges at 16mm. It’s perfect for timelapses and filming your own face. A vloggers dream. Sony 70-200mm f/2.8 G Master lens: This is a long lens that has ruined all other long lenses for me. The 70-200mm G Master is super sharp at every focal length, with speedy auto focus and can be used with a 2X extender to lengthen its range even more. It’s my first choice for my long lens. Sony 24-70mm f/2.8 G Master lens: Filling in the gap between my wide-angle 16-35mm and the long reach of the 70-200 is this 24-70mm f/2.8 G Master. Like the other G Master lenses in my bag, it's sharp to the edges at all apertures. Rode VideoMicro Shotgun Microphone: A mic with super clean quality in a form factor that makes sense. The Rode VideoMicro uses phantom power from the camera, is always on and handles wind like a pro. It’s my favorite audio solution for videos. Sony α7 Battery Grip: On longer shoots, this grip makes swapping batteries one less thing I have to worry about. Plus it brings along a couple more features aside from power: A bottom grip for vlogging which is actually really comfortable from the ‘selfie’ position, and a set of buttons on the bottom for more shutter, autofocus, and exposure options. Anker PowerCore Portable Charger: If you don’t have external power for your phone, camera during a long time-lapse and headphones, you’re setting yourself up for a frustrating day. This Anker retains power longer than all of the power banks I’ve used so I’m a lifelong customer. Zeiss Camera Cleaning Kit: A lens wipe and dust removal air tool is something you never regret having in your bag. Peak Design CapturePRO Camera Clip: If John Wick was a vlogger, he’d use this clip. You can attach your camera to your hip or backpack in an instant and you’ll never go back to holding it in your hands between shots like a troglodyte. This mounting plate is also compatible with my favorite tripod head the Manfrotto 496 RC2 (which i’ll get to next). Manfrotto Befree GT Carbon Fiber Travel Tripod: A newer addition to my bag, this thing is super compact and reliable. It’s now my main timelapse tripod for travel. It folds up way smaller than you’d imagine a full sized tripod would be capable of. It’s carbon fiber so it takes up barely any weight in my bag. I use the 496 RC2 tripod head on this tripod (and all my tripods) so that I can hot swap my camera from place to place. GorillaPod Focus Tripod: This is probably the least original piece of my kit since everyone on YouTube has one. The convenience of a malleable tripod that can hold the weight of a real camera is a huge help when I need to position for a quick shot and I can’t set up the full tripod in time. DJI Mavic Drone: The Mavic is made for the solo video production kit. It folds into a super-compact form factor and packs a punch with its video (and photo) capabilities. SmallHD Focus On-Camera Monitor: I went way longer than I should have without checking my shot before recording it. Without a forward-facing camera display, it can be tough to nail a shot that you’re the center of. Whether it be focus, exposure or lighting, this monitor is small, bright and easy to use for filming oneself. Western Digital MyPassport SSD: I didn’t realize the technology that this drive uses even existed before trying it for myself. I then proceeded to have my mind blown. It’s a rugged, fast working SSD for backups (or even editing) while on the road. But the coolest part is the auto footage dump feature. I place my SD card into the slot on the side, press a button and the footage deposits itself safely and organized into a folder on the drive. I can literally plug my SD card into this thing, put it back into my bag, and continue shooting while my previous footage gets comfortably placed onto my backup drive. Peace of mind in SSD form. SanDisk SSD Hard Drive: This is my go to editing drive for on the go jobs. It packs a quick read/write speed for editing on a portable setup like my laptop. I bring a backup because if the footage ain’t backed up, it ain’t safe. Fenix PD 35 Tactical Flashlight: Everyone who I’ve ever traveled or even gone out for a night with knows that I don’t leave home without my flashlight. It doesn’t even really have any video production benefits for me but a solid flashlight on your hip is invaluable in so many situations. REI Waist Pack: I wear this all the time, even when I’m not shooting. A TSA agent recently told me how cute my man-purse looked when I placed it on the security belt…and it was that moment that I realized how you can be hyper-functional while also looking really cool. Polar Pro Camera Lens Filters & Polarizers: I can’t recommend these enough. They’re built with the same quality as the lens and can serve so many purposes. Long exposure shots, filming at lower aperture in daytime, or even just protecting your lens. I can’t remember the last time I filmed anything without these. Lowepro ProTactic 450 AW (My Bag): One of my (and TSA’s) favorite bag. By favorite, I mean TSA loves opening it up and touching all my camera gear. Unfortunately I haven’t found the bag that will prevent security from getting to know all your gear on a personal level. But this bag has been with me on every bit of travel over the last three years and has fully won my heart. With customizable storage, an exterior harness system, built-in rain cover and a dedicated tripod holder there’s really no weak point of this pack. The zippers are insanely durable and the waist strap system makes even a heavy bag manageable to carry for hours at a time. These are the things that help me share my life with the world. 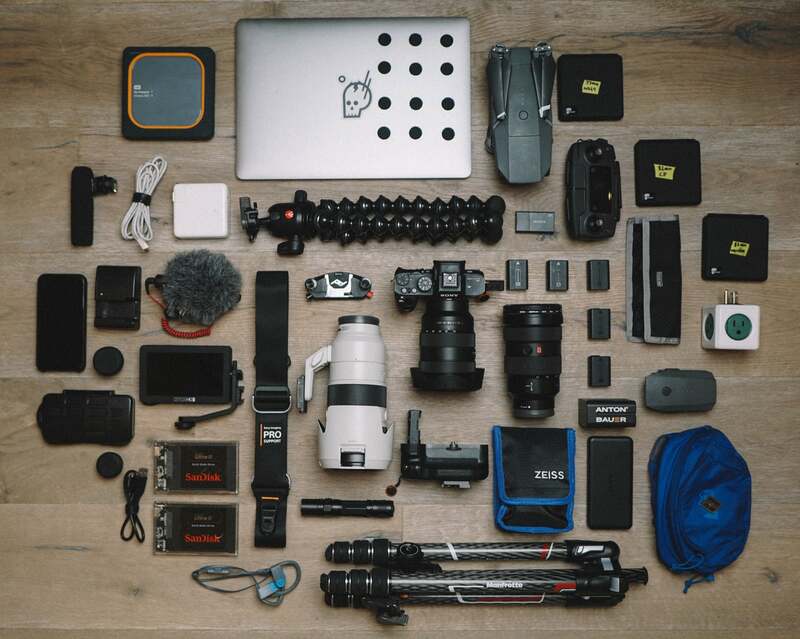 This collection of video production tools has proven itself time and time again. Assembling a kit can seem overwhelming, but my advice for anyone starting out would be, first, to find a camera that you like, get to know it, and you’ll see a natural growth in your toolbox from there. Vlogging is as fun and unique as you make it, so get your gear together and get out there. The Internet will be watching. Julien Solomita is a member of the Sony Alpha Imaging Collective. Follow all of their adventures on Instagram https://www.instagram.com/juliensolomita. So You Want To Be A Vlogger? What Makes A Good Vlog?